These top quality flameless LED candles give a natural appearance and realistic flickering while assuring the safety you desire. 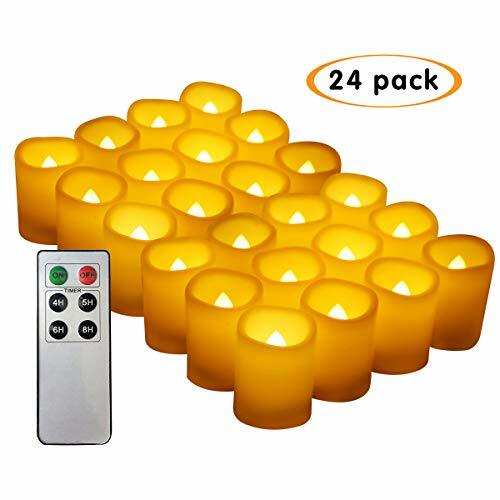 Flameless tea lights are your best choice for wedding, party, holiday and home decorations. They are safe to use and environment-friendly. In addition, it is a great gift choice, for Valentine's Day, Mother's Day, Halloween, Thanksgiving, Christmas, New Year, and the list goes on¡­. These candles are made of high quality plastics and can be used outdoor on days without rain. The long battery life (approx. 150 hours) and low unit price offer you great economic value. 3.Size: 1.5" in diameter,2" in height. 5.Battery life: around 150 hours. EASY TO USE WITH REMOTE, simply turn on and off by remote control.The remote control has 10-20 foot range. Remote is very useful when candles are not easy to acces. LONG BATTERY LIFE: powered by one CR2450 battery (included),Long battery life up to 150 hours, save your money on batteries.